All persons who have reached their 14th birthday are bound by the law of abstinence. All adults are bound by the law of fast up to their 60th year. Ash Wednesday and Good Friday are days of abstinence from meat and also days of fast; that is, limited to a single full meal. The other Fridays of Lent remain days of abstinence from meat. 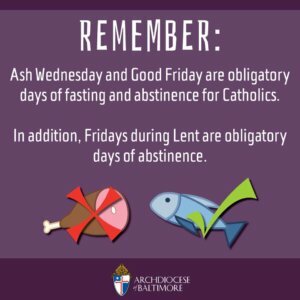 The Fridays of the year outside Lent remain days of penance, but each individual may sustitute for the traditional abstinence from meat some other practice of voluntary self-denial or personal penance; this may be physical mortification or temperance or acts of religion, charity, or Christian witness.